Offering lots of water sports oppurtunites, Santa Rosa is a hidden gem in Eastern New Mexioc. 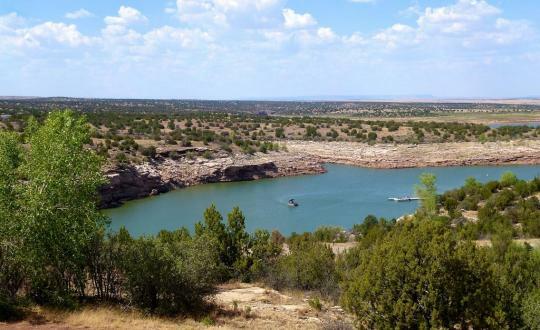 Santa Rosa offers excellent spring and summer bass fishing. Directions from Albuquerque, take I-40 East to exit 273. Follow 2nd Street north to Eddy Ave, follow signs North for 7 miles to Santa Rosa Lake State Park. How's Santa Rosa Lake Fishing? Fishing is fair using crank baits and grubs for both smallmouth and largemouth bass. Fishing is fair for walleye using tubes and minnows.